You are at:Home»Coast Guard»Coast Guard roundup: Surviving an eagle attack, and should the Coast Guard use the LCS? 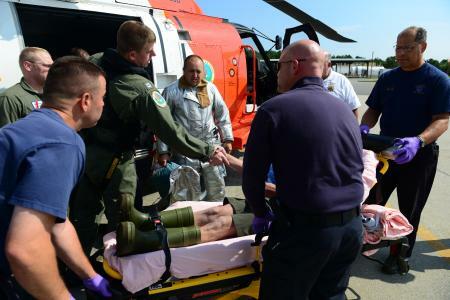 From eagle attacks to life-saving boots to new uses for littoral combat ships — maybe — here’s a round up of recent Coast Guard odd news. Let’s start with a report from Alaska: Coasties were attacked by an eagle in the Dutch Harbor Post Office in Unalaska. Eagle attacks are apparently not that rare for people living up there, see here. Then there was the man charged with allegedly attacking a Coast Guard boarding officer in San Francisco. The man was also charged with allegedly making a false distress call. He claimed that a Coast Guard boarding team would be committing an “act of war” if they boarded his vessel, according to SFGate.com. On to better news: The Coast Guard saved a man who spent 12 hours at sea hanging on to his boots before being rescued — see video here. Finally, somebody in the Coast Guard community thought that instead of waiting for the Coast Guard to build its offshore patrol cutters, the service could just buy the littoral combat ships used by the Navy. The question was posted on the “Ask the Master Chief” column, hosted by the Coast Guard’s acquisition directorate. The master chief replied that it would be like using “a turbo-charged two-door sports car when they really need a V-6 minivan.” Of course, the Navy’s particular turbo-charged sports car has had trouble going places lately. The LCS is under fire from GAO, and recently the LCS Freedom lost propulsion out near Singapore — not its first setback. In this instance, patience might be a virtue. Got any Coast Guard stories worth sharing on Scoop Deck? Email arico@navytimes.com.